Located in Mariánské Square the new town hall was built when the Old Town Hall was no longer sufficient for the growing Prague in the beginning of the 20th century. In 1909, the winner of the competition for the new building, architect Osvald Polívka, presented his final project, adjusted to the requirements of the artistic committee. The building had to correspond in appearance to the surrounding monumental buildings: today’s National Library Clementinum and the Clam-Gallas Palace. The construction took place in the years 1909 - 1911; the newly build Secession building has a rectangular shape of 90.5 x 37 m, and it extends on a surface area of 3,350 m2. The building can be entered via a monumental entrance in the central buttress of the main front at Mariánské Square. Interestingly, this is the first place in Prague to be using the paternosters. There was a box-office assembly hall on the first floor with a surface area of 568 m2, second largest in Prague after the Main Post Office in Jindřišská Street. There was the city box office, the accounting office, tax offices, etc. Altogether, the building could offer 7 463 m2 of offices and there were 250 official rooms. 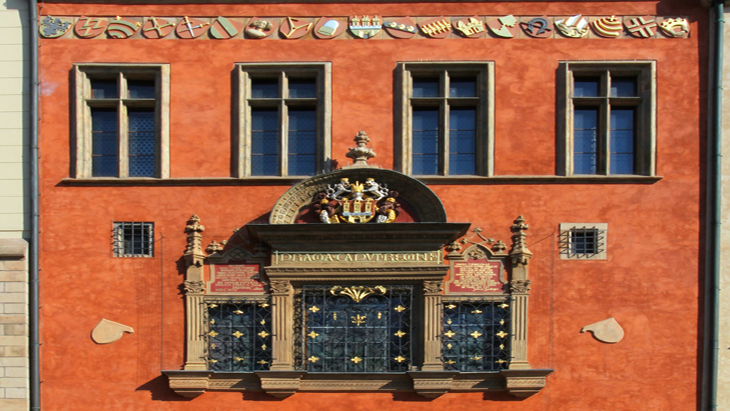 The main front is richly decorated - there are symbolic relief sculptures by Stanislav Sucharda, for instance, Sucharda’s relief above the main entrance arch represents the Protection of the City Treasure, while above the large central window on the first floor, there is a relief of a Girl bowing towards the symbols of the city independence and self-government, i.e.the town emblem and the bailiff right. There are also figural sculptural groups with the themes of Strength and Endurance by Josef Mařatka on both ends of the balustrade. You can also see the statue of Rabbi Löw on the corner at Linhartská Street and the statue of Iron knight on the corner of Platnéřská Street, both made by the prominent sculptor Ladislav Šaloun.